I just want to preface this review by professing my love for Soul Eater. Adapted from the manga from the same name by Atsushi Ohkubo, Soul Eater is a 51 episode series animated by studio Bones which aired from April 7, 2008 to March 30, 2009. The series embraces its shonen origins with flashy fights and themes of friendship while relying on lush animation and a colorful cast of characters that range from ultra serious to nonsensical. Scattered throughout the episodes are a host of unique and over the top characters made distinctive as a result of the show’s visual flare like Death the Kid whose unusual need for everything to be symmetrical often times drives him into violent rages and the loud mouthed Black Star, whose skill is matched only by his enormous ego. The Character’s designs are a bit “cartoony”, a departure from other anime but they fit with the overall light hearted tone the series projects. The early episodes are episodic in nature, introducing a pair of students at a time as they set out on one mission after another. This doesn’t last long however, with the introduction of the supporting cast of Stein, Spirit, and Lord Death, the series opens up to longer arc driven plots focusing on the Academy’s struggle to combat the Witch Medusa, whose machinations revolve around an ancient evil buried deep beneath the city. Action is Soul Eater’s forte and this set promises no shortage. The individual battles between the meisters and Medusa’s group are wildly inventive and sure to please even the most jaded of shonen fans. The animation is uniform throughout. There wasn’t the slightest dip in quality to be found, a testament to the staff of Bones. Quality-wise, these episodes are very easy on the eyes, showcasing fluid animation and a wonderful color palette. Funimation’s high definition upgrade accentuates the animation, tightening the lines and adding potency to the colors. There is also a standard release of the set for those without the benefits of Blu-ray. The Extras are bit beefier than the norm for anime releases. 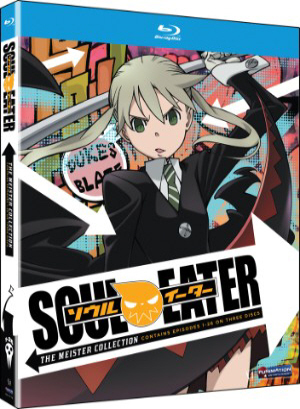 Everything from the past releases is ported over including audio commentaries and an assortment of clip segments titled the “Soul Eater Late Show” that run roughly a minute each. Trailers and textless openings and endings round out the set. Soul Eater screams “cool” and this set is demonstrative of that. The episodes are fast paced from start to finish and packed with more action and irreverent humor than most series fit into an entire series run. If you missed out on Funimation’s first run of releases, the meister collection is the way to go, giving consumers double the episode count for a fraction of the price. This is a series that should have a home in every anime fan’s library, right alongside classics like Cowboy Bebop and Dragon Ball.